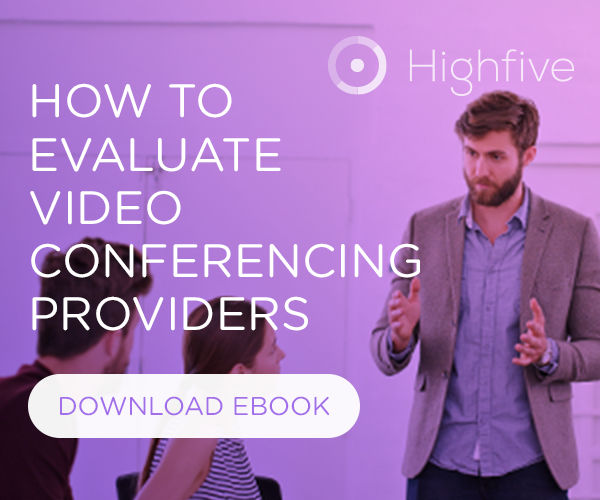 Your Highfive device may be positioned in a variety of ways in your conference room. Ideally the camera lens should be placed about 12 inches above seated eye level. However, depending on how your display is mounted, that may not be a viable option. Fold open the black foot at the bottom of your device. Place the Highfive device on top of your TV and fold the foot towards the TV until your device fits snug. The bottom lip of the camera housing and the foot of the device should grip the frame of the television. Both the lip and foot have rubber finishes to help with grip and stability. Using the included wall mount, find a suitable place either above or below your television to install your Highfive device. With the built-in level, align the mount so that the bubble appears perfectly in the center. While holding the bracket to the wall, screw in the 3 included screws into the wall. Open the foot and slide your device into place. Remove the screws + wall mount and place one of the included dry-wall brackets in each hole. Using a hammer, insert bracket into the wall. Repeat for the remaining two holes. Replace the wall mount, and screw the bracket back into place.